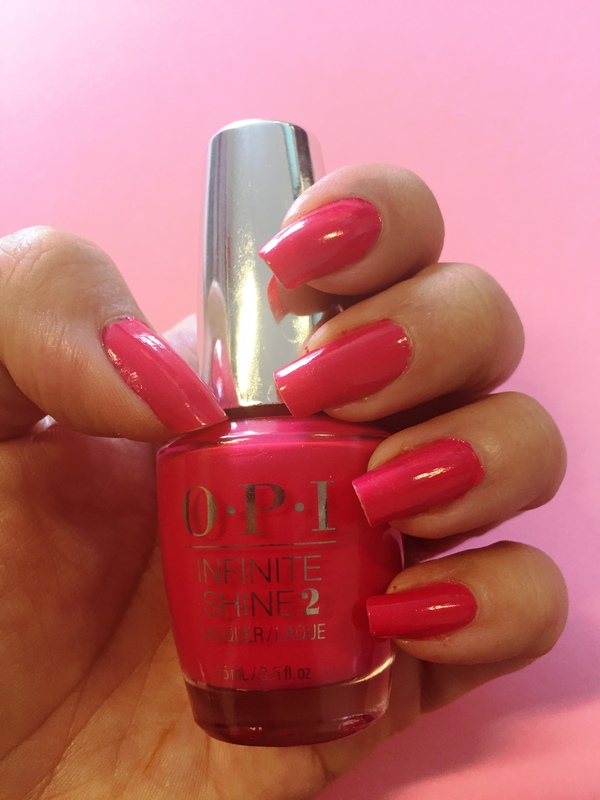 OPI Infinite Shine : Goodbye to gel nails ? OPI has come out with a replacement to gel nails ! 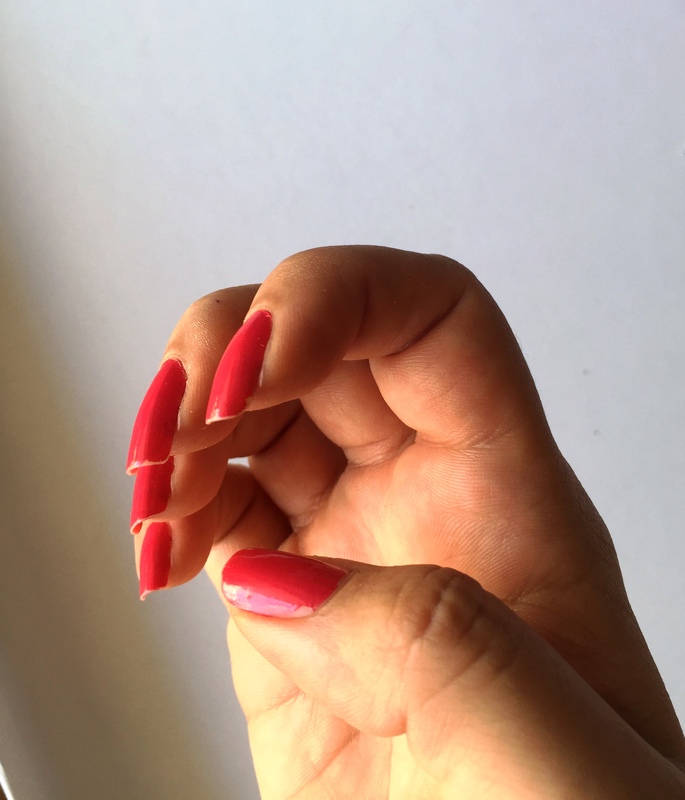 A lot of companies are coming out with their version of the gel nail but without the hassle of the UV light or special products to take it off. But when OPI does it, I take notice, especially since I’ve always been a fan and it’s my favorite nail polish brand. 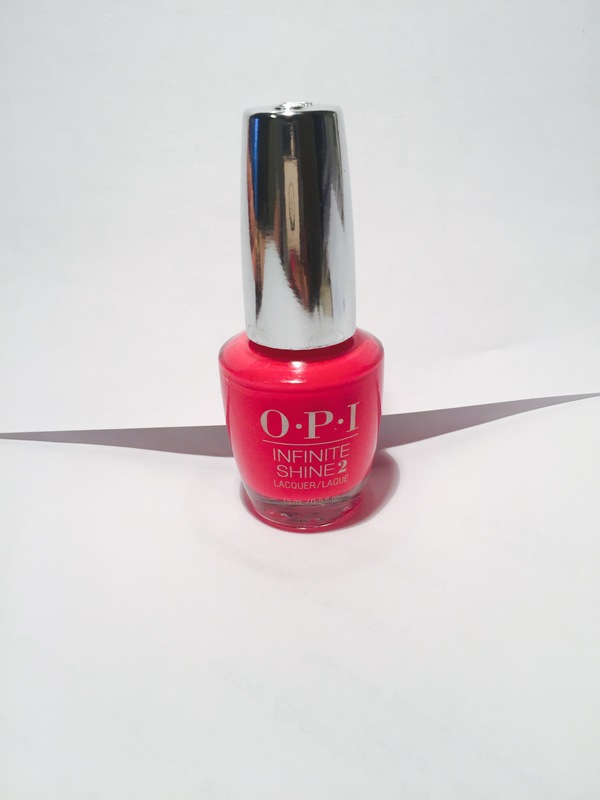 I was at Sephora, – as usual on a Saturday J – when I saw the new OPI Infinite Shine and decided to give it a go. 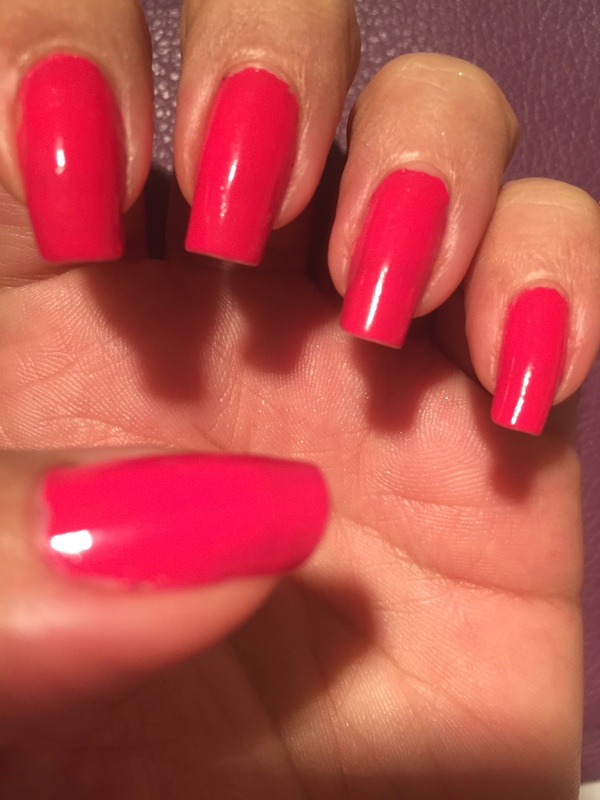 I’m missing summer already and decided to go with the color “Running with the In-finite crowd” which is a hot almost neon pink. I do need to mention that I can be either a sucker for really good packaging or a sucker for a good name! And OPI is the top nail polish “namer” in this category in my opinion. No hard to remember names like ‘2564p’ or bland unimaginative ones like ‘Blue’, but names with a twist on words or a pun every time! The OPI names just crack me up ! I only bought the color as I already have a favorite base and top coat and I wanted to test the polish out before committing to the whole system. I should also state prior to actually starting this review that I’ve got a lucky star in the nails department and mine grow fast and are strong. Most polishes wear pretty well on them. I also have to admit I’m not much of a handy person, so I don’t do any gardening or actual manual labor, unless you count nail art and scrap booking haha! I wear gloves when I do the dishes. I also have a desk job, so the most strenuous task on my nails is typing! 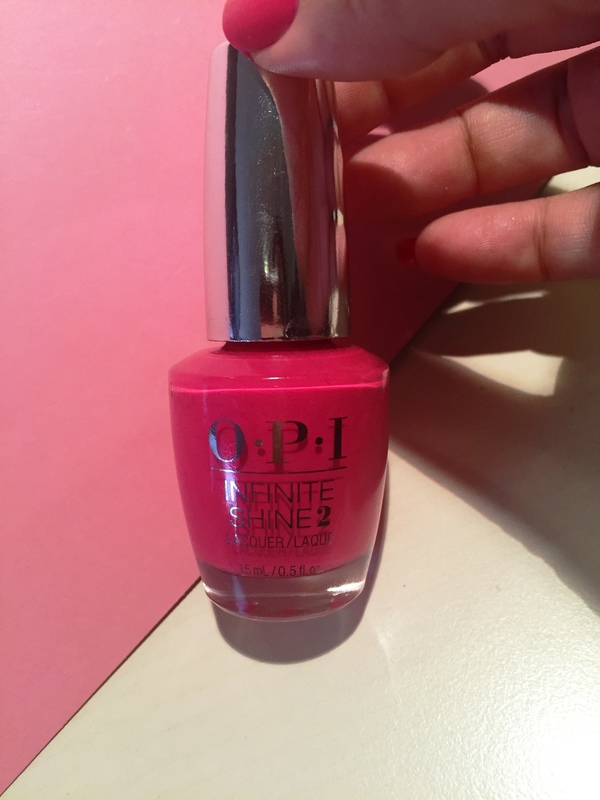 I put on OPI Nail Envy base coat and without waiting for it to dry (which I never do), I immediately started applying the OPI Infinite Shine 2 color. The consistency of the polish was not gel like at all, it was nice and thin without being too watery. It applied smoothly and very easily. The brush strokes weren’t apparent. 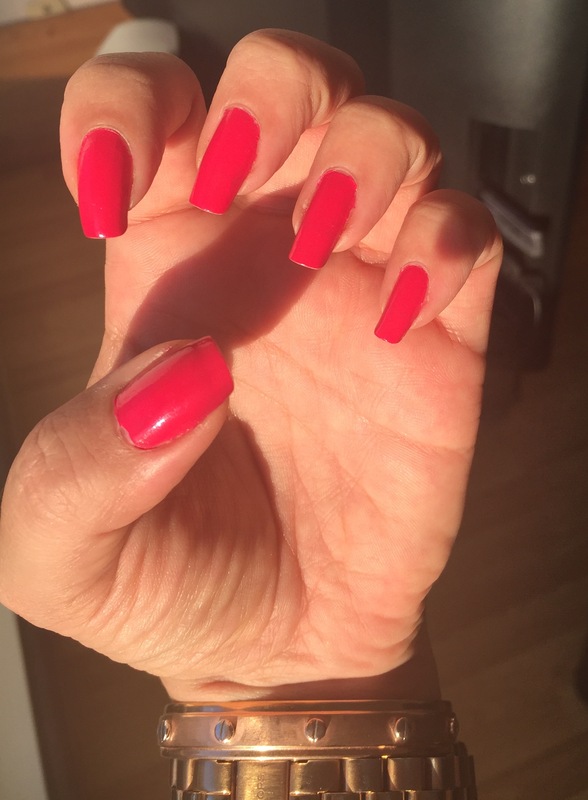 OPI says to apply two thin coats but I found the color so vibrant and opaque after one coat I decided to test as is with just one coat. I also decided to forgo a top coat since I hadn’t purchase the Infinite Shine 3 from their system. I thought it would give me a pretty accurate idea of the wear of this polish with no help from a top coat. I decided to test it out for the amount of time OPI claimed the polish would last. 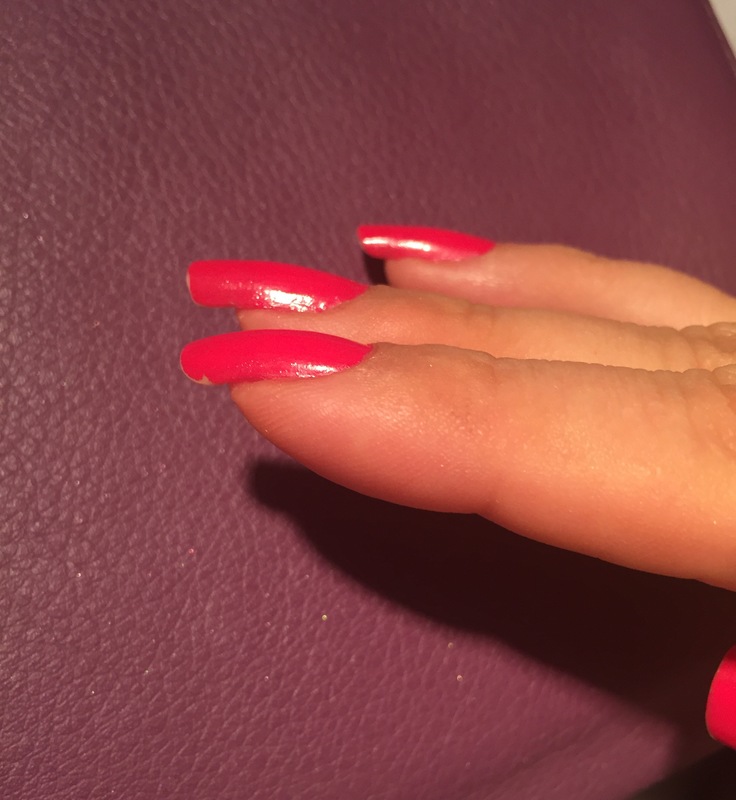 No visible chipping or wear even on the ends of my nails. The color is still just as vibrant and shiny. The mani still looks brand new! I started to have very minimal chipping on the index finger of my right hand, which is the hand I use more frequently as I’m right handed. There started to have a tiny bit of wear on the tips of my nails. I don’t think it’s noticeable for most people unless they do a close up of my nails. My left hand nails seem to be holding up just fine though. I have a second small chip on my right hand middle finger and the ends of the nails are definitely showing some wear with the white peeking out. This might be due to the fact that I didn’t use a top coat. So for day 6, it’s not so bad. My thumb also has a chip near the cuticle. All in all I am ready to take the polish off. I guess it could last one more day though. 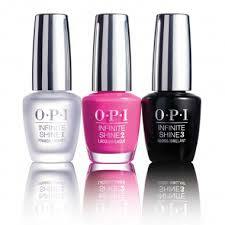 My final thoughts : I would definitely recommend the OPI Infinite Shine 2. The colors are vibrant and opaque after just one coat which is very rare. I’m impressed with the longevity especially since this was accomplished without the help of a top coat to protect the polish from chips and prolong the shine. After one week the shine was still very much. 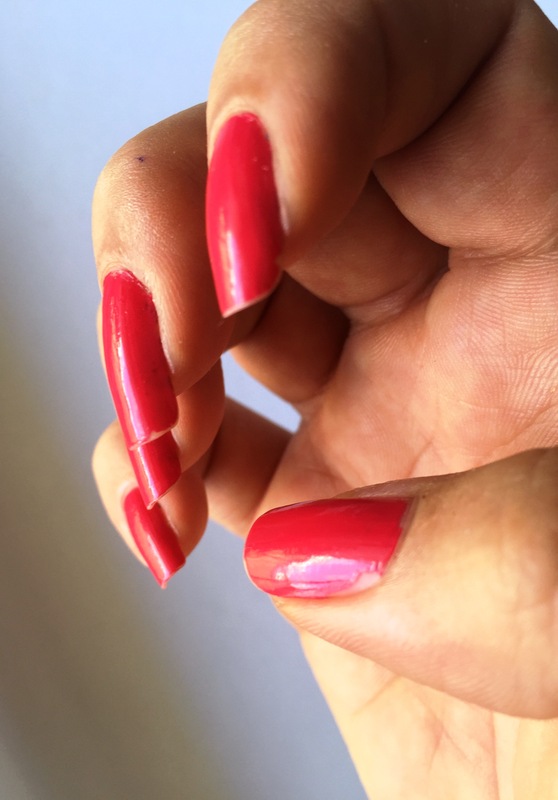 I do have to say that I’m not a fan of gel nails in general, as in my experience it does damage your nails ,including the whole getting it off process, and after wearing gel nails for a while, I find my nails to be in poor condition. So any nail polish that claims to have the same long lasting and shine properties without hurting my nails is a must have. I guess I’ll have to go and buy the rest of the system OPI Infinite Shine 1 & 3 and then get back to you with an updated review as to whether or not it was worth it. This polish is hassle free and long wearing a definitive hit ! What are your favorite long wearing nail polishes?